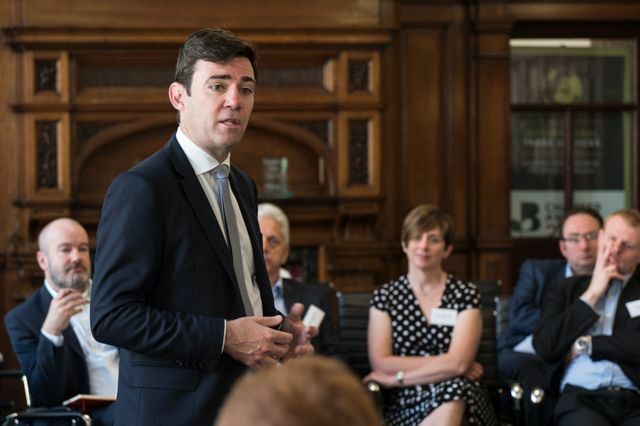 Andy Burnham has launched his leadership team, which includes council leader Sir Richard Leese, after becoming Greater Manchester's first elected mayor. Burnham has selected Manchester City Council leader Sir Richard Leese as deputy mayor. Sir Richard will lead on business and economy issues. Meanwhile, former Home Office minister Beverley Hughes has been nominated to become Greater Manchester's first deputy mayor for policing and crime. And Bury Council leader Rishi Shori has been chosen to become portfolio holder for young people and social cohesion. Burnham secured 359,352 votes which is equivalent to 63.4 per cent. Burnham said: "Greater Manchester is going to take control. We are going to change politics and make it work better for people." Mr Burnham and other cities with a new mayors should benefit from strong, visible leadership and international standing that a mayor can bring. The mayor of London has become a vital part in ensuring that a great city has a strong voice and can attract investment from home and aboard. All of the the new mayors will influence many key areas for their respective cities, such as planning, transport, employment, economic development, health and policing. All are big topics and all take time to influence/change however I'm excited about devolution and the improvements we should all see. Leigh MP Andy Burnham is a high-profile figure within the Labour party, having previously served as health secretary, culture secretary and chief secretary to the Treasury. He twice stood for leader of the Labour party, losing out to Ed Miliband in 2010 and Jeremy Corbyn in 2015.